My god, I love the FA Cup. The evisceration of Southampton's U-13s last weekend put us into today's draw for the Fifth Round Proper, and what a draw it was. If you missed it, we're away to Sutton United of the National League - the top division outside the Football League itself. I happened to have caught their 0-0 third round home draw against AFC Wimbledon, so I know a little about these guys (sidebar: I started a "start from the bottom" game of Football Manager a while back, and my Hemel Hempstead side lost home and away to this lot, too). If you're one of the many who don't know much about the U's, then consider this your primer for what should be a cracker of a tie. 1. So, where IS Sutton, anyway? Glad you asked. Funny thing is, any time we have a tie against a club that's outside of our usual sphere, my first reaction is that we may as well be playing somewhere on the moon. Sutton? That's in outer Mongolia somewhere, right? A few other things of note: Twickenham is where they do the rugby, Watford is just visible in the northwest part of the screen, and there are a few other places here that have clubs kicking around at or near Sutton's level. By my count, I see Slough, Hayes (if that's where Hayes & Yeading play), Woking, Bromley, Gravesend, Dagenham and Boreham Wood (where our Ladies play, last time I checked). Non-league clubs are not beholden to the old Taylor Report guidelines, meaning that these are some of the only seats in the whole place. According to Wikipedia, the capacity is a shade over 5000, but only about 750 of it is seating. This is from the school that closed down before the old school was built. 3. 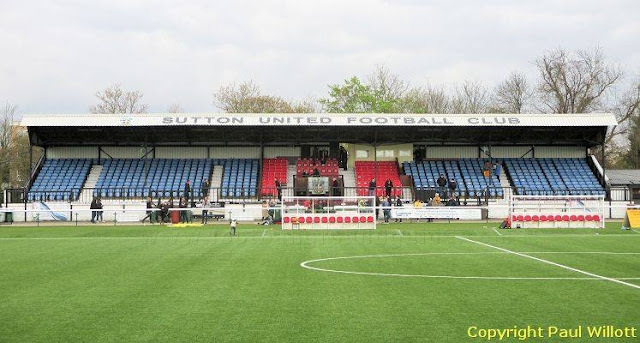 Furthermore, Sutton United utilizes a 3G plastic pitch at their ground. That's one thing for when I have my crunch 7-a-side league ties at Bushwick Inlet Park or McCarren Park, but at this level? It's highly unusual and it's going to take a major adjustment for our guys to be able to play on it. As you might expect, Sutton's home record is exceptional given their familiarity with the conditions. The ball bounces differently on it, passes have to be weighed more carefully, etc etc etc. Especially given that our style of play relies on a large number of exquisitely precise passes, we might struggle to break down the 10-man defensive wall that Sutton will inevitably throw up to try and repel us. 4. In case you're wondering why the 3G pitch is there and allowable in their division, you have to keep in mind the finances of football down in the old Conference and thereabouts. Sutton are in the National League, which is the point where most of the clubs start becoming fully professional and such. However, the feeder league for that is the Conference North and Conference South, both considered the 6th division. Down there, you get a lot of semi-pro clubs, who may have a handful of top players tied down to professional contracts. Otherwise, the roster is filled out with pay-per-appearance deals, so that one or two misfires in the transfer market won't bankrupt the club. Given that reality, it's not shocking that most of these sides don't have amenities like under-soil heating in their grounds. Hence, they get far more postponements than we get up in the Premier League. The 3G pitch largely prevents that from happening, and at this level that can have significant financial benefits. It's also easier for the league to not have to reschedule a million fixtures as well. 5. There is an Arsenal connection here, by the way. One of Sutton's top players is a guy named Craig Eastmond. Gooners of a certain age may remember him as one of our own academy kids. Eastmond never broke into our first team, but he did see action in the League Cup and - bizarrely - as a substitute in a Champions League tie away to Shakthar Donetsk in 2010. 6. So, how did Sutton get here, anyway? Again, the reality of life in the National League couldn't be further from our experience as a top Premier League side. Whereas we enter in the Third Round Proper every season, Sutton's adventure started even before you can throw the word "proper" around. The National League sides come in at the Fourth Qualifying Round stage, where Sutton knocked off their division colleagues Forest Green Rovers 2-1 at home (the "at home" is going to be a pattern, which in fairness is a massive reason why they're here). 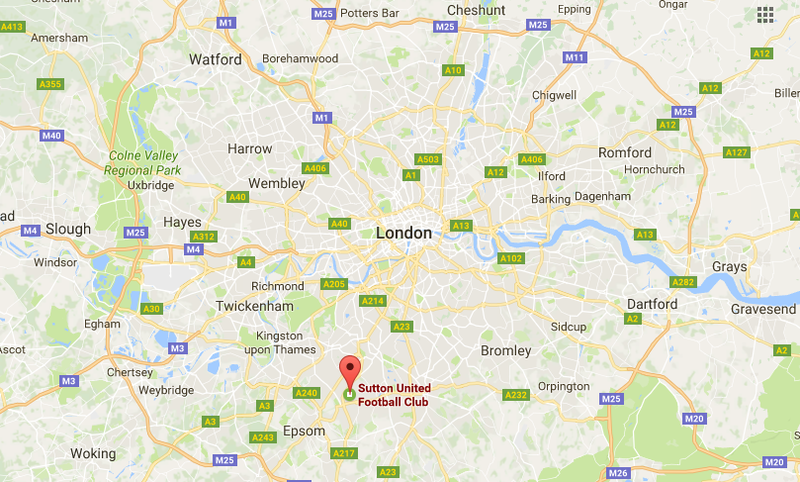 That got them into the hat for the First Round Proper, where they traveled to National League South club Dartford (visible in the map screenshot above). They prevailed 6-3 in a bonkers game, where they scored in the 1st minute, saw it get to 2-2 by the 17th, actually went down 3-2 before storming back to win it. The next hurdle was Cheltenham Town, who are currently in League Two. Sutton's 2-1 victory was seen as a massive giant-killing for them at the time, but they were just getting started. AFC Wimbledon was next, and a hard-fought 0-0 draw at Gander Green Lane honestly looked like the end of the line for them. A replay away to Wimbledon, who had survived a crazy tie against Curzon Ashton already (0-3 to 4-3 in about four nanoseconds) was a tough ask, especially as they were 1-0 down early. But, they got three goals - two in injury time - to send the Dons crashing out. Next up was a home tie against Leeds United. Frankly, I thought this was going to be it for Sutton, but Leeds are more worried about promotion than anything else this season, and they ended up fielding a reserve side. Bad move, as a 53rd-minute penalty sent them out of the competition. 7. A word of warning: In 1988-89, Sutton United defeated Coventry City 2-1 in the Fourth Round of that season's FA Cup. An even more dire word of warning: Coventry were in 2nd place in the old First Division (the equivalent of the Premier League now) at the time. 8. Meet Jennie the Giraffe, the mascot of Sutton United. Maybe we can get Gunnersaurus a date, eh? 10. 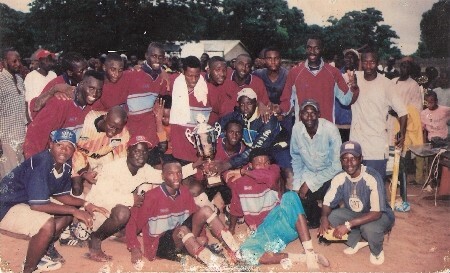 Believe or not, there is also a Sutton United Football Club in the third tier of football in the African nation of The Gambia. They are, sadly, not eligible to compete in the FA Cup. So, there you have it. You're all now up to speed on our opponents in the goddamn greatest cup competition in the world. I'm psyched for this, and you should be too.